This Hasty-Bake Stainless Steel Legacy Charcoal Grill is the original Hasty-Bake design and the most popular model. The Legacy features an 18 gauge polished stainless steel hood and base; 523 sq inches of cooking surface; 1/4 inch diameter nickel plated cooking grids; stainless steel side and front work tables; an adjustable charcoal tray, 18 and 12 gauge stainless steel lift and fire box; and a door on side for easy charcoal access and cleaning. 10 year warranty. Grill Dimensions (in inches): 41 1/2 W x 21 D x 42 H (52 H with hood open). 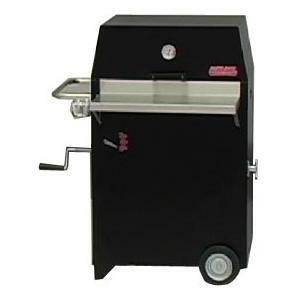 Front table measures 28 W x 9 D.
This Hasty-Bake Suburban Black Powder Coated Charcoal Grill is known as the mini work horse of the Hasty-Bake product line. 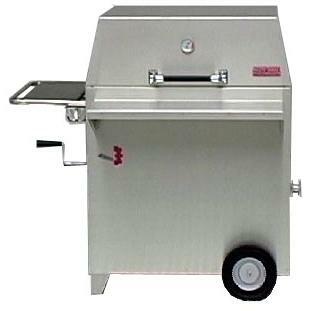 The Suburban features a 20 gauge powder coated base and hood; 289 sq inches of cooking surface; 1/4 inch diameter nickel plated cooking grids; 18 and 12 gauge galvanized steel lift and fire box; stainless steel front work table; an adjustable charcoal tray; and a door on side for easy charcoal access and cleaning. 5 year warranty on parts/workmanship. 1 year warranty on finish. Front shelf measures 20 1/2 W x 9 D. Overall Grill Dimensions (in inches): 34 1/2 W x 16 D x 38 H.
This Hasty-Bake Black Powder Coated Legacy Charcoal Grill is the original Hasty-Bake design and the most popular model. The Legacy features an 18 gauge powder coated hood and base; 523 sq inches of cooking surface; 1/4 inch diameter nickel plated cooking grids; stainless steel side and front work tables; an adjustable charcoal tray, 18 and 12 gauge galvanized steel lift and fire box; and a door on side for easy charcoal access and cleaning. 5 year warranty on parts and workmanship. 1 year warranty on finish. 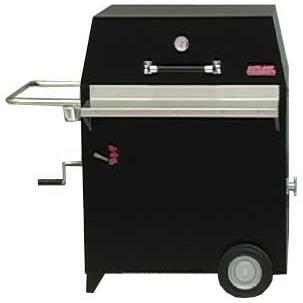 Grill Dimensions (in inches): 30 W x 21 D x 42 H (52 H with hood open). 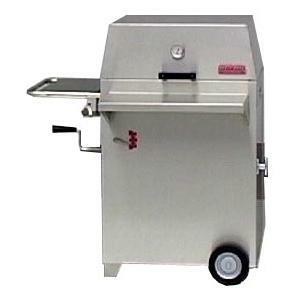 Front table measures 28 W x 9 D.
This Hasty-Bake Suburban Stainless Steel Charcoal Grill is known as the mini work horse of the Hasty-Bake product line. 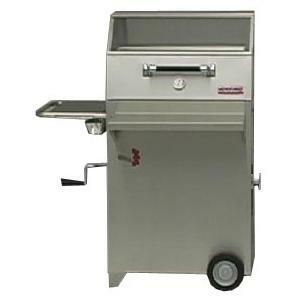 The Suburban features a 304 grade, 20 gauge polished stainless steel base and hood; 289 sq inches of cooking surface; 1/4 inch diameter nickel plated cooking grids; 18 and 12 gauge stainless steel lift and fire box; stainless steel front work table; an adjustable charcoal tray; and a door on side for easy charcoal access and cleaning. 10 year warranty. Front shelf measures 20 1/2 W x 9 D. Grill Dimensions (in inches): 34 1/2 W x 16 D x 38 H.
This Hasty-Bake Stainless Steel Continental Charcoal Grill is a smaller version of the popular Gourmet grill and is a terrific choice for those who appreciate the features of the Gourmet, but have limited outdoor space. The Continental Stainless Steel Charcoal Grill features a 20 base; 20 gauge stainless steel hood with 3/16 inch tempered glass window; 504 sq inches of total cooking surface (289 primary); heavy 1/4 inch diameter nickel plated cooking grids; stainless steel front and side tables; an adjustable charcoal tray; 20. 5 x 10. 75 inch removable warming rack; and a door on side for easy charcoal access and cleaning. 10 year warranty. Front Shelf measures 20 1/2 W x 9 D. Grill Dimensions (in inches): 34 1/2 W x 16 D x 43 H.